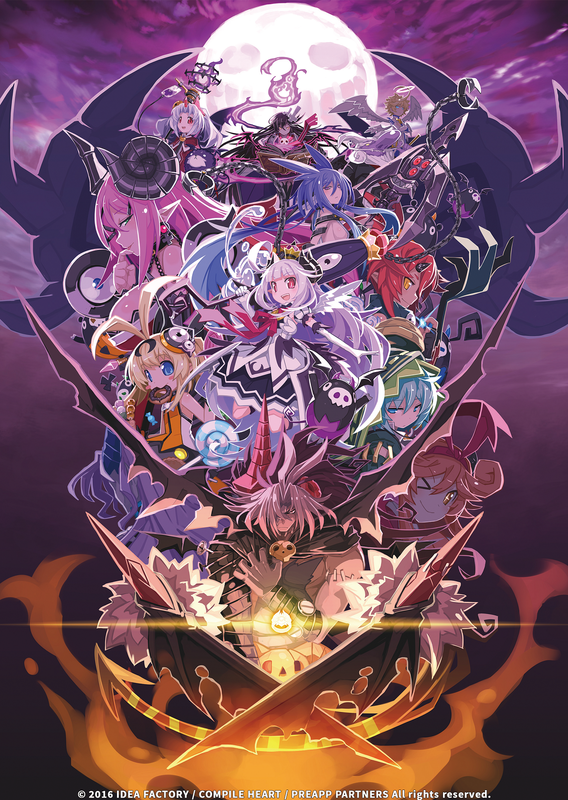 PS Vita Review: Trillion: God of Destruction | "DESTROY ALL FANBOYS!" 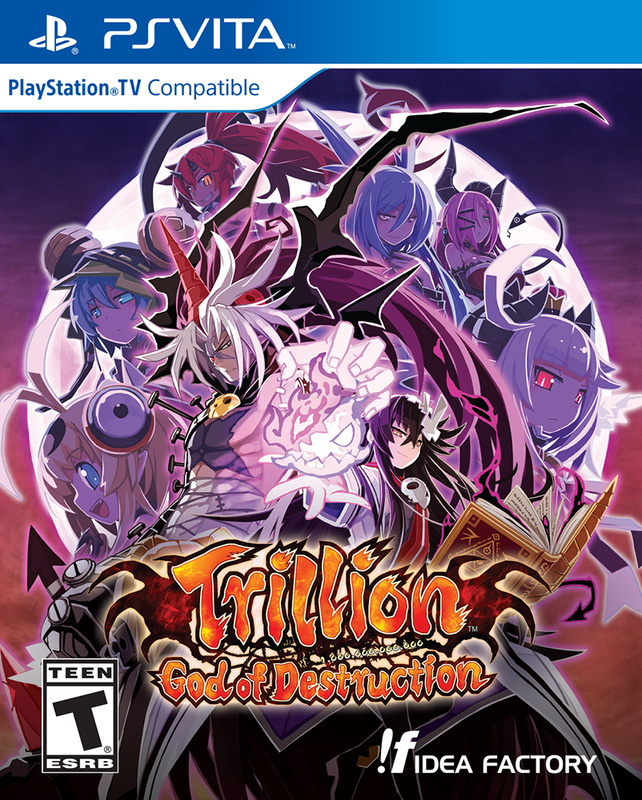 While it’s not perfect, fans of Compile Heart’s offbeat and often gal-filled JRPGs should find Trillion: God of Destruction right up their respective alleys. Actually, you’ll probably need to travel through at least one of those alleys and hope there’s a game shop located somewhere at the end of that trip so you can pick up a retail copy if digital isn’t your thing. 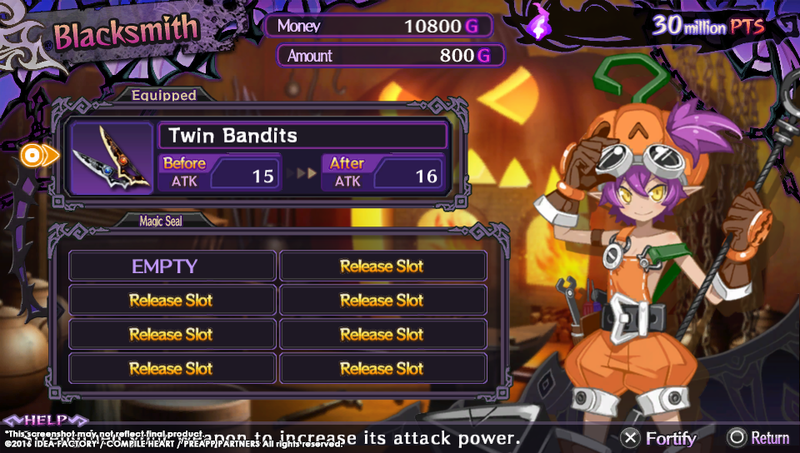 The game feels like a hybrid that mixes Princess Maker-style mini-games, nice art that looks quite like a Disgaea spinoff (former team members from that series worked on the game), and core gameplay that’s akin to a Mystery Dungeon game meets Vandal Hearts 2 but with a more awkward camera that will mildly to moderately mess with your mojo. After the titular titan Trillion bumps off Zeabolos, the Supreme Overlord of the Underworld, his brother and about a million minions, it’s up to his female Overlords to get revenge on that massive one plus a dozen zeroes HP creeping terror before it lays waste to their home. Poor Zeab is revived and reconstructed to the best of her ability by a lady with an appropriately Faustian name (Faust) who makes him an offer he can’t refuse. She creates a single ring that the Overlords can wear that will boost their powers considerably provided they also train while Trillion sleeps parked near the gates to the Underworld. Of course, Faust’s deal comes at the cost of Zeab’s soul once the big baddie goes beddie-bye for good. But whomever defeats Trillion instantly becomes his successor and new Overlord of the Underworld with all the riches, sweets and other treats that entails. Each of the Overlords is named after one of the Seven Deadly Sins, although Wrath seems to be AWOL (or perhaps Trillion is the embodiment of that particular sin, what with the constant anger, poison miasma and generally destroying stuff in one hit whenever possible). The gals are all pure Compile Heart fan service catering to those who don’t mind the mixture of anime eye candy and familiar blend of wacky humor, serious plot elements and even a bit of light romance options. 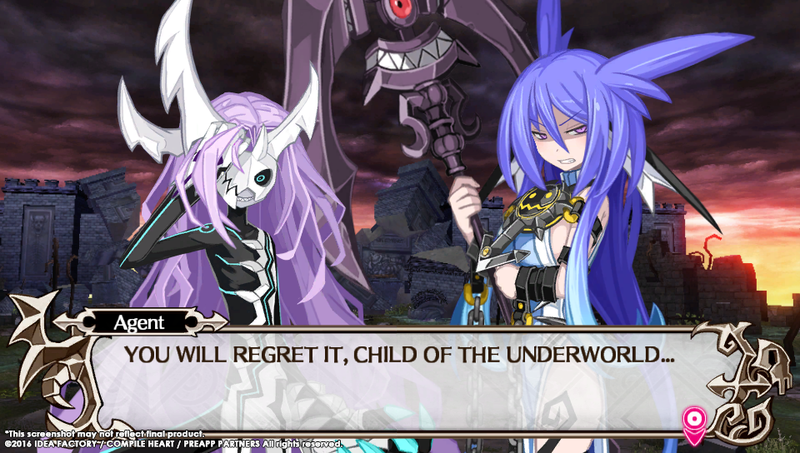 While each one has her motives for becoming the new Overlord once they defeat Trillion, the game gets even more intriguing because you discover the probability not every gal will survive the experience. Initially, it seems this isn’t a game where you’ll zap Trillion off the map with your first character or even your second or third unless you’re paying attention and can maximize training and proper leveling of skills. You can retreat from a battle and live to fight another day, but there’s a cost for that. If you do lose an Overlord, before she expires she gets in a final attack that either damages Trillion or slows down the next rampage and allows you more time to train. After the opening battle that lays Zeabolos low, Trillion goes to sleep for a week and you get to choose who fights and get to the simulation aspects. While the bulk of these sections are brief self-playing mini-games with random outcomes, there are two types of practice battles you can play in order to get accustomed to the combat system. There are single floor “dungeons” where you can earn experience and handy items while trying not to exceed the number of steps allotted. 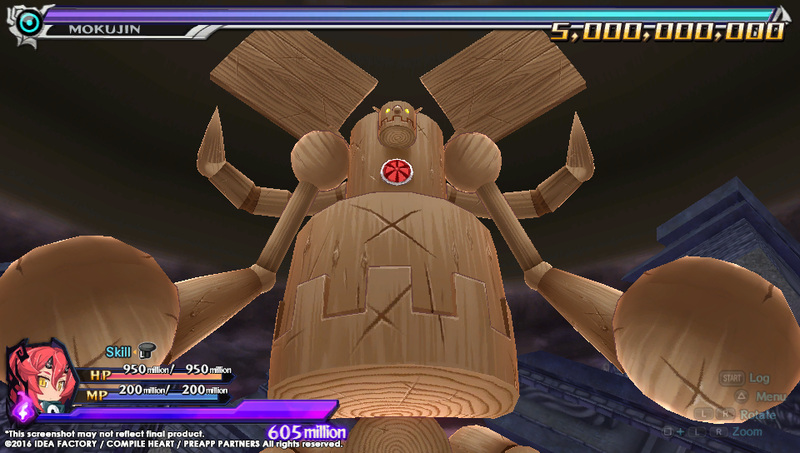 The other battle is against a training boss named Mokujin who has attacks like Trillion but isn’t out to kill your gals at all. You’ll need to master these battles early on because there’s no room for error when fighting Trillion. His attacks are all telegraphed but you’ll encounter packs of enemies appearing around you as you make your approach. 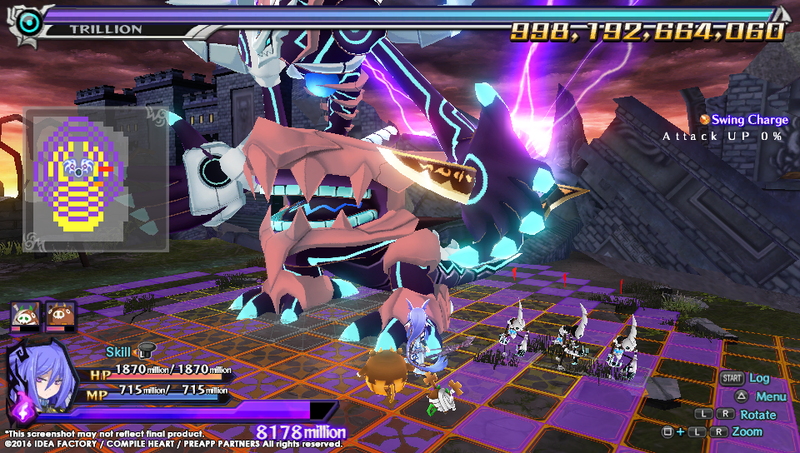 The main problem with the combat is the game camera and fact that you need to rotate the battlefield map to move diagonally and it’s too easy to make an error that leads to your Overlord getting hit by foes or worse, one of Trillion’s decimating attacks. It’s like having to turn a chess board sideways when playing diagonal moves (awkward!) and while you do get used to it (sort of), you sort of wish that movement was less of an issue because as one ongoing boss battle, trying not to get hit (or get hit as little as possible) is key to beating the game. That said, you get more than enough opportunities to practice that if you’re dialed into the combat, you’ll make less mistakes. Once you get the hang of things, the flow of the game is going to please those who love extended cut scenes and lots of dialog more than those who want constant combat right out of the gate. I wouldn’t call this a visual novel at all, but it certainly has a lot of story to relay with plenty of drama and humor to spare. At the core of the game is the battle(s) with Trillion and you’ll find plenty of upgrades to weapons, skills and stats that can keep your ladies alive longer. Presentation is a mixed bag of niceness and a tad rushed, but overall appealing. While the 2D character art is lovely, the music is great and the story has its emotional highs and lows, the otherwise colorful polygon grid based combat is be a bit stiffly animated but nicely buried under a ton of pretty visual effects. This isn’t an action game at all, so it definitely be a huge issue to fans who’ll grab the game automatically. On the other hand, some strategically minded JRPG’s have benefited from nicer attention to detail than what’s found here. I’m hoping the game does well enough to get a bigger sequel that expands upon a few things. There are multiple endings (the internet says a least 11) and the game can take upwards of 30 hours to beat the first time. I cleared the game in about 34 hours with four Overlords lost (ah well), but had enough of a good time that going back for a second run is a no-brainer. Well, after I whittle down my rather large backlog to something I can see over. This entry was posted in 2016, Commentary, DAF, Features, Humor, Updates and tagged BUY This Game, Coming Soon, Compile Heart, Digital Games, Idea Factory, PlayStation Vita, PS TV, PSN, Reviews, SEN, Sony, Trillion: God of Destruction, VGA 101, Videogame Appreciation 101, Videogame Reviews, Videogame Trailers, YouTube by geelw. Bookmark the permalink.